How to make a Fugly into a FFFFFFFFFFFFFFFFFFFUUUUUUUUUUUUGGGGGGGGGGGGGLLLLLLLLLLLLLLLYYYYYYYYYYY! Really not nice, but it seems that the whole fairing contraption moves with the handlebars? Must be scary riding that slow. 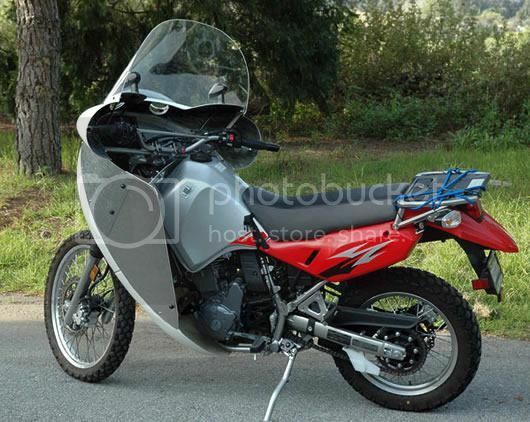 Looks like a new KLR, with the old tank. And then of course that abortion at the front. I don't shame easily, but I'll be too bloody embarrassed to ride that thing in public. It's cool. If he can just give the windscreen a bit of a slant, it will almost look like those racing fairings from the early 60's. I remember seeing a site selling these a while ago, windjammer fairing? Found it... it's an Alcan fairing! Craig is regarded by some to be the fairing guru. He may be a fairing guru, but he's definitely no style guru. I see it is the top part that rotates with the steering, while the bottom part stays stationary. Weird bloody thing. so dit maak die KLR dalk stadiger? Die ander ding is jy gaan geen windgeraas he nie. Die probleem is dan kan jy die engine behoorlik hoor. 'n Single klink altyd asof hy enige oomblik uitmekaar gaan val met al die ratte,kettings en kleppe wat grind,klap en fluit.